Parents and teachers staged an angry demonstration as Kent County Council (KCC) met to discuss the possible closure or merger of primary schools. Eleven schools are threatened with closure and 22 more may be merged to create 11 new schools as the county adapts to falling numbers of pupils. The School Organisation Advisory Board (SOAB) met on Thursday to discuss how to reduce primary places in Maidstone. Kent currently has 14,200 empty school places - 11.59% of the total number. The council wants to reduce the surplus places by more than half, to five per cent. Over the next five years it wants to cut 800 places in Maidstone, where the district's 53 primary schools have a surplus of 12.56%. "The national fall in the birth rate is having a considerable impact on how we run our schools," said cabinet member for education John Simmonds. "Each empty place costs £250 a year so doing nothing is not an option. "I understand the anxiety these proposals cause but they should ensure the future viability of schools in the area." In Maidstone alone, five schools are affected by proposals which will now go out for public consultation. Governors at Detling Church of England Primary have already voted in favour of closure. Two mergers are also proposed, between Platts Heath and Kingswood Community primaries and Hunton Church of England Primary with Laddingford St Mary's. 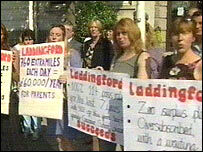 "Laddingford is a highly successful school," said headteacher Charlotte Jarvis. "It is thriving - the roll is rising, we have numerous awards and we are very much part of the community."